Jerry Grant after qualifying CV Enterprises “The Mystery Eagle” for the 1972 Indianapolis 500. This May, we’ll likely see several tributes to Dan Gurney recounting his achievements and contributions to the Indianapolis 500 (and to auto racing in general) as a driver, car designer and team manager. And rightly so, because the Big Eagle was a key figure in IndyCar racing starting in the early 1960s. His first All American Racers Eagle appeared at the Speedway in 1966, and the marque was a serious contender for victory in the 500 for the next decade-plus. Much like A.J. Foyt did with No. 14, Gurney made the No. 48 famous, and his name and team always will be associated with that number – at least among us Indy old-timers. In 1972, All American Racers brought a new Eagle that outclassed everything but the new McLarens by a wide margin. Lead driver Bobby Unser upped the pole speed by more than 17 mph, a feat unlikely to ever be matched. The driver of the Mystery Eagle is a mystery. Unser’s teammate was Jerry Grant, whose association with Gurney dated to 1965 when he co-drove with him in the Daytona Continental. 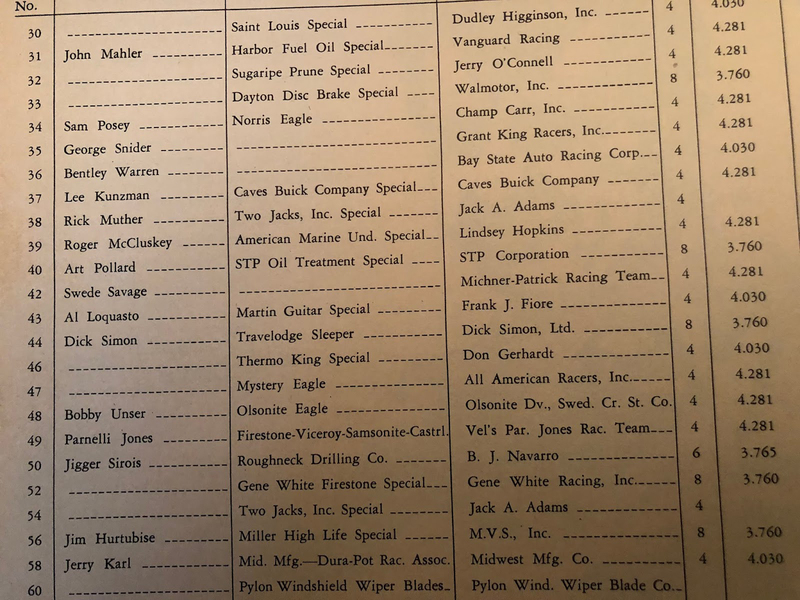 While Gurney might have had Grant in mind for the assignment at Indianapolis, it wasn’t official until well into the month – Grant wasn’t listed as the nominated driver in either the program or the “names and numbers” list you used to be able to buy at the track for one thin dime. Still a mystery. Parnelli Jones is entered? The 1972 500, when Jim Nabors first sang “Back Home Again in Indiana,” saw Unser jump to a commanding lead before falling out with mechanical failure after 31 laps. His 30th-place finish was by far the worst finish for the pole-sitter in the 1970s. Gary Bettenhausen led most of the race before being sidelined in the late stages with ignition woes.This opened the door for Grant, who led for 16 laps. On Lap 188, Grant made a surprise pit stop, motioning at his right front wheel. Directed into Unser’s pit stall, the crew hooked up the fuel hose from Unser’s tank. Oops. Grant seemingly trailed Mark Donohue to the checkered to take second place, but officials later determined that taking on fuel from another tank was illegal. So Grant’s final 12 laps were discounted, dropping him from second to 12th. This decision cost All American Racers about $72,000 in prize money. Gurney’s wallet then took another hit as Vallo disappeared soon after the race. My good friend Bill LaDow has graciously allowed me to link to a couple of stories related to Vallo’s skullduggery. You can read more on his site “Speedway Sightings.” The links are here and here. For Grant, despite the sour ending, the 1972 Indianapolis 500 in many ways represented his best performance at the Brickyard. He competed in the next four 500s, but never led again and his best finish in that span was 10th. He was, however, the first IndyCar driver to officially turn a lap above 200 mph – 201.414 mph in qualifying for the 1972 500-mile race at the now-defunct Ontario Motor Speedway. After his driving career, Grant was often seen at the Speedway as a representative for Champion Spark Plugs. He died Aug. 13, 2012, at 77.